This recipe is inspired by a Tart Cherry Galette recipe seen on Cheese Curd in Paradise. I originally started by using some of my frozen Door County cherries picked earlier this summer for the sousvide... but when I made it, I didn't realize how overcooked and mushy the cherries would result after popping them in a sous vide. As a substitution, I used what I did have on hand which were some Honeycrisp Apples. I do hope to make the Tart Cherry Galette with my frozen cherry stash for the holidays and serve it with some 'Cherry Bounce' liquer... so stay tuned! For this recipe, I peeled and quartered some honeycrisp apples (although any firm apple variety will do). 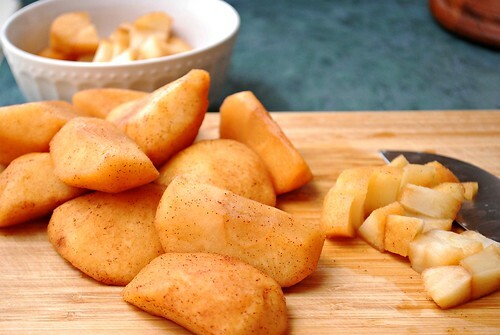 I tossed the quartered apples with brown sugar, cinnamon and a small amount of vanilla extract in a bowl, then transferred the coated apples into a large cooking pouch. Using the vacuum sealer, all the air was removed from the pouch, which intensified the seasonings and flavors onto the apples. 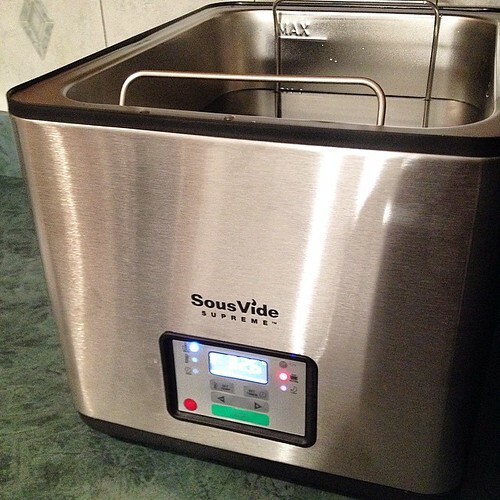 This was another recipe that put my SousVide Supreme to good use! 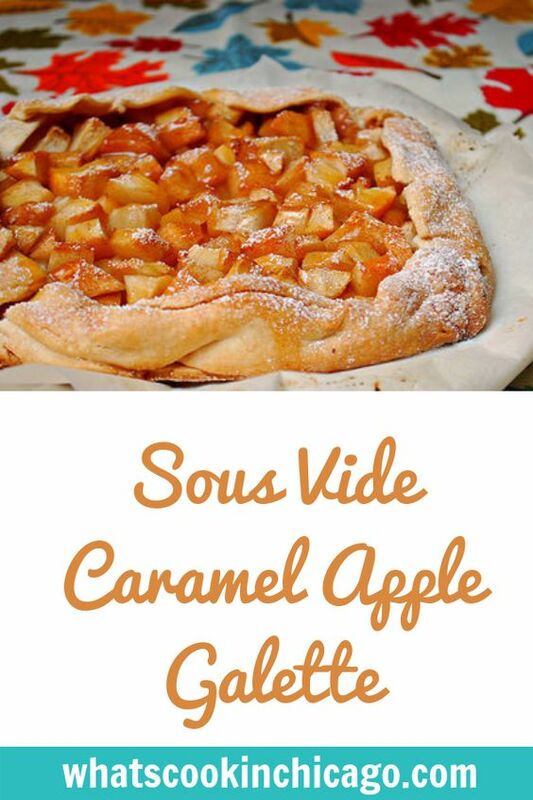 Fill and preheat the SousVide Supreme water oven until water reaches 143 degrees F.
Place apples, brown sugar, cinnamon, vanilla and lemon juice in a bowl and toss to coat. 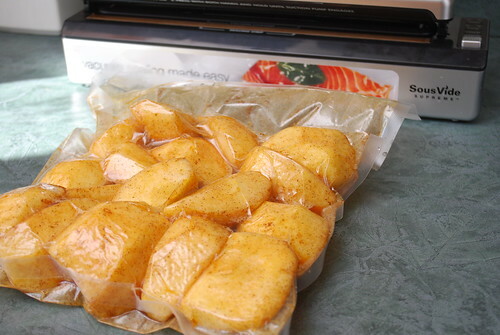 Transfer apples into a large gallon (3.8 liter) cooking pouch or food safe vacuum sealable bag. Vacuum seal according to manufacturer's directions. Submerge the vacuum sealed roast in the water and cook for 1 hour. Remove apples from the pouch and dice. On a lightly floured work surface, roll out pie dough into a rough circle. Spread the diced apples over the pie dough, leaving a 1 inch edge of dough all around. 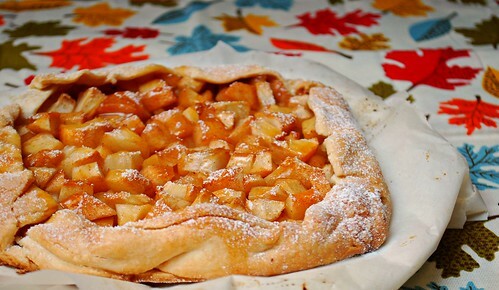 Fold the pie dough edge up and over the apples to create a 1 inch border. Bake the galette for about 45 minutes or until the edges are nicely browned. Transfer to a cooling rack and allow to cool. Just before serving, dust with powdered sugar and drizzle with caramel sauce. * I recently posted about the Cookeezi Stainless Steel Lemon Squeezer Citrus Juicer and I used this tool to juice my half lemon. It did a great job squeezing every bit of juice out of the lemon half and it also left behind the seeds. It was easy to use and I love that it can also be washed in the dishwasher!